(19/P026) TRENTON – More than 184,000 freshly stocked rainbow trout will be available when anglers cast their lines on the opening day of trout season this Saturday, April 6, DEP Commissioner Catherine R. McCabe announced today. Approximately 100,000 anglers of all ages will be heading to their favorite fishing spots on this eagerly anticipated day. Trout season kicks off at 8 a.m., offering an excellent opportunity to spend quality time outdoors while enjoying some of the best trout fishing on the East Coast. Most trout being stocked will average 10½ inches but large breeders, measuring 14 inches to 23 inches and weighing up to 7 pounds are also distributed in the early weeks of the season. Approximately 570,000 rainbow trout will be stocked statewide by the end of the spring stocking season. The state's 14 major trout streams are stocked every week following opening day and are closed to fishing from 5 a.m. to 5 p.m. on the day of stocking to allow the trout a chance to disperse. All other waters are open to fishing on stocking days following opening day, with most stocked at least three times. 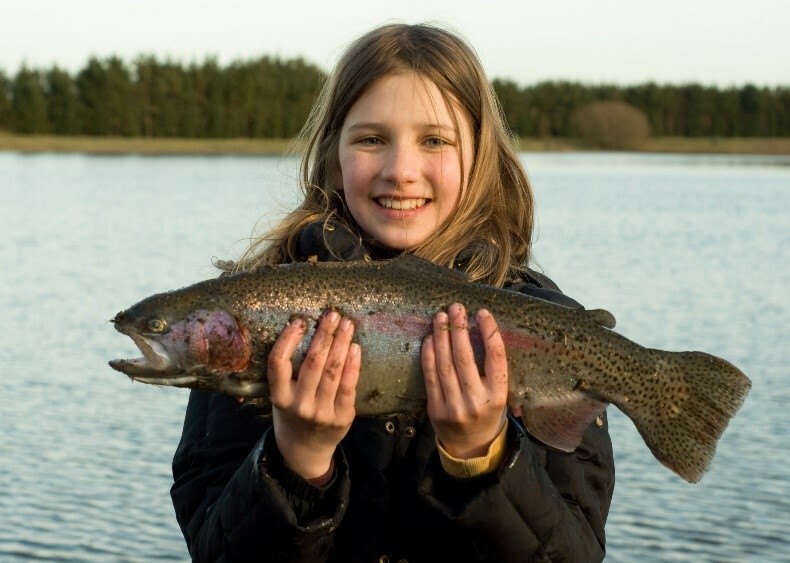 Select lakes and ponds will also receive additional huge trout as part of the Bonus Broodstock Lakes Program. This year, nine trout-stocked lakes and ponds located throughout the state will receive 30 to 50 broodstock fish, providing even more excitement for anglers. A list of these waterbodies can be found at: www.njfishandwildlife.com/bonus_brdstk19.htm. Anglers will also be happy to learn that many of the big trout stocked last fall will have carried over and are available to catch this spring. These fish have grown even more since they were stocked. Anglers can download the complete in-season stocking schedule to their smartphones just by scanning the QR code found in the 2019 NJ Freshwater Fishing Digest. Trout stocking information is also available through the Trout Stocking Hotline at (609) 633-6765. Print copies of the Freshwater Fishing Digest are also available at license agents and Division of Fish and Wildlife offices. Anyone age 16 or older must obtain a New Jersey Fishing License and Trout Stamp to fish for trout. Anglers can easily purchase these online at www.nj.wildlifelicense.com/ or through license agents. A list of license agents is available at: www.njfishandwildlife.com/agentlst.htm. The Division of Fish and Wildlife’s Pequest Trout Hatchery is supported with proceeds from the sale of fishing licenses, trout stamps and federal funding from the U.S. Fish and Wildlife Service’s Sportfish Restoration Program. The dedicated funding received from the purchase of a fishing license and fishing equipment enables the Division of Fish and Wildlife to enhance fishing opportunities in New Jersey and protect the quality of the state’s waters for fish, wildlife and people.